Under this agreement, we render accounts for fees and disbursements on a periodic, usually weekly, basis or at such other times as decided by us or when disbursements are incurred. Our accounts are payable within seven (7) days of being rendered. We may apply any monies held on trust on your behalf towards payment of our accounts in accordance with this agreement. If there are insufficient monies held on trust on your behalf to pay our accounts and you do not pay our account within seven (7) days of it being rendered, we may terminate our retainer in accordance with this agreement. If you fail to pay the full amount of any account by more than thirty (30) days of the due date, we may charge you interest on the amount outstanding from the due date until payment in full at the rate provided for in the Legal Profession Act 2008 and the Legal Profession Regulations 2009. Within thirty (30) days of receiving a bill of costs that is not itemised, you may request an itemised version. 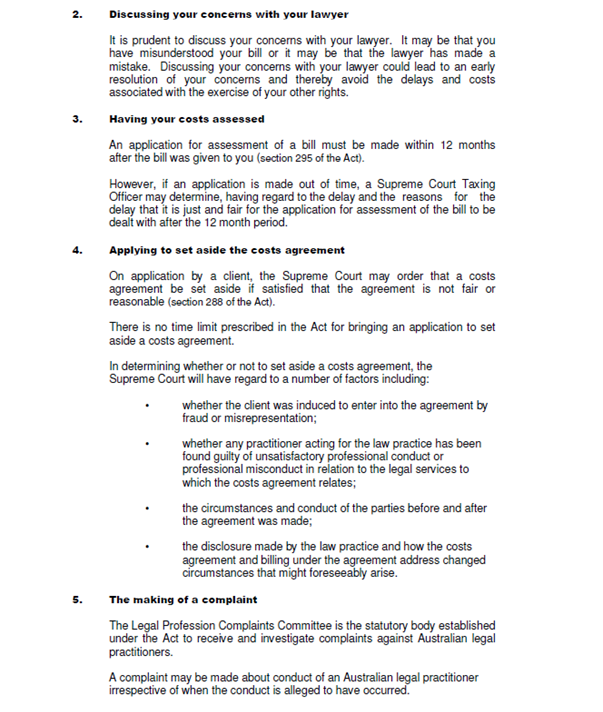 Within twelve (12) months of receiving an itemised bill of costs, you may apply to a taxing officer of the Supreme Court of Western Australia for an assessment of the whole or any part of a bill even if the legal costs have been wholly or partly paid. We may immediately apply, at our discretion, any money we hold on trust on your behalf, in payment of disbursements we have paid or are liable for on your behalf and in payment of our accounts in accordance with this agreement. If we do this, we shall advise you in writing within fourteen (14) days. It should be noted that this clause survives should this agreement be terminated. We may receive on your behalf any money due to you in the course of, or as a result of legal proceedings and we may immediately deduct from any such money, and transfer to our account, any amounts necessary to pay the fees and disbursements in accordance with this document. In matters where we are retained by you and another party, both you and the other party will be jointly and severally liable to pay our costs and disbursements in accordance with this document. You may terminate our retainer at any time for any reason by giving written notice. However, you will remain responsible for all costs which we may properly charge up to the time of receipt by us of the written notice of termination. If we can no longer ethically act for you. If our retainer is terminated, then we will not be obliged to take any further step in the conduct of the matter and (where applicable) we will be entitled to file a notice of ceasing to act, or where a court otherwise orders. In the event that our retainer is terminated you are entitled to receive your original documents in our possession only upon paying in full our accounts which we may have rendered prior to the termination of our retainer and any final account which we may render following the termination of our retainer and such accounts can be paid out of trust monies. This offer document contains the terms of our retainer and our costs agreement in relation to this matter and any subsequent matters in which we are instructed by you. 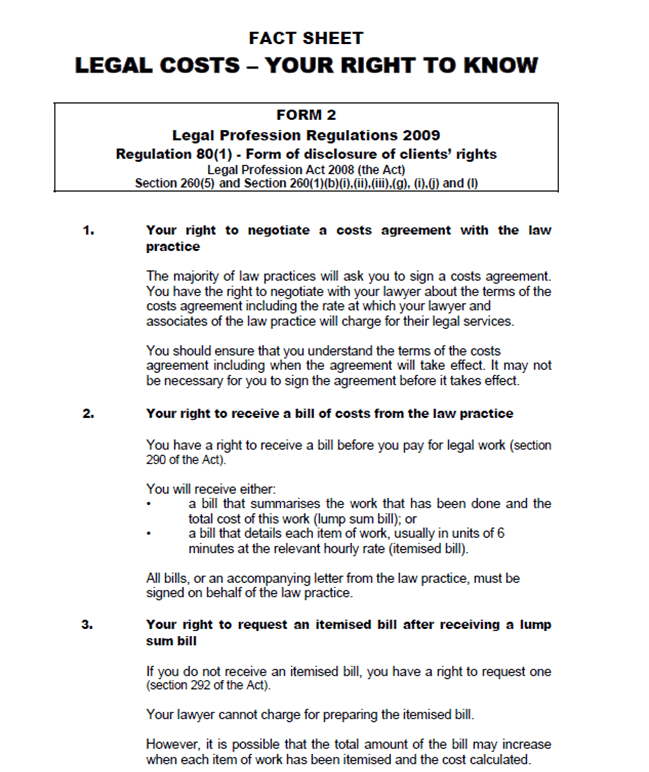 Please note that Form 2 “Legal Costs – Your Right to Know” forms part of this agreement, and is available for viewing on this page. Please read this agreement carefully and consider its terms before signing it. This offer may be accepted by you in writing or by your conduct by continuing to give us instructions, or otherwise confirming that we are to proceed with your matter. In other words, even if you do not sign this agreement, you may be deemed to have accepted the same. If there is anything you do not understand, please ask our Kyran Borges Nunes to explain it to you. You may wish to seek independent legal advice before signing this agreement. Under this agreement, we charge all our fees on the basis of time spent doing work in your matter in accordance with the rates set out in paragraphs 8 and 11 below, all of which do not include GST. Our rates are reviewed periodically and are adjusted from time to time. We shall notify you in advance of any such adjustments. Upon notifying you, this agreement will be deemed to be varied unless you terminate our retainer in writing within fourteen (14) days of receiving notice in accordance with this agreement. To facilitate ease of time retrieving, we use a system of ‘unit’ recording. Under this method, each hour is divided into ten units of six minutes each. The minimum amount of time spent on a task will be recorded as one unit, even if it takes less than one full unit of time. For example, a phone call may take less than six minutes, but will be recorded as one unit. This will mean that the standard hourly charge-out rates of the people working on the file will be exceeded in those circumstances. The time recorded for tasks which take more than six minutes will be rounded up or down at our discretion. The tasks that we will record include all telephone conversations, correspondence, conferences, filing, researching, considering, drafting, amending, checking, settling, perusing, and attending Court or other places (including preparation, waiting time and travelling time). We will act in your best interests, however we are not required to, and will not, do anything which is unethical or unlawful. Our lawyers will take carriage of your matter. 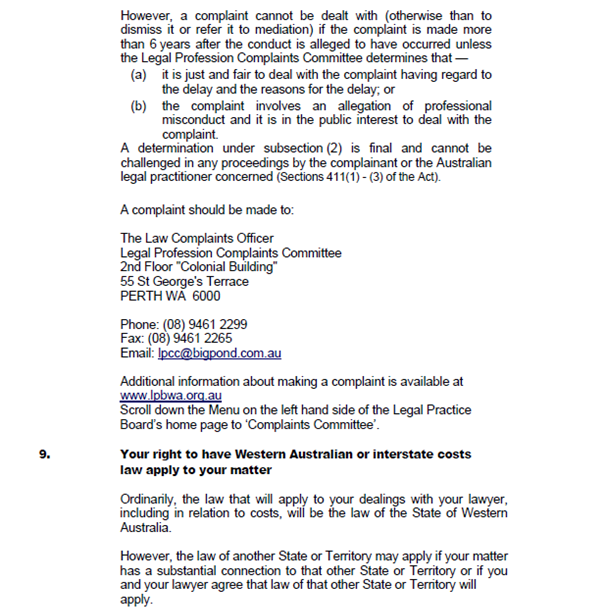 Aimee Price is a Solicitor whose charge out rate is $350 per hour (exc GST). 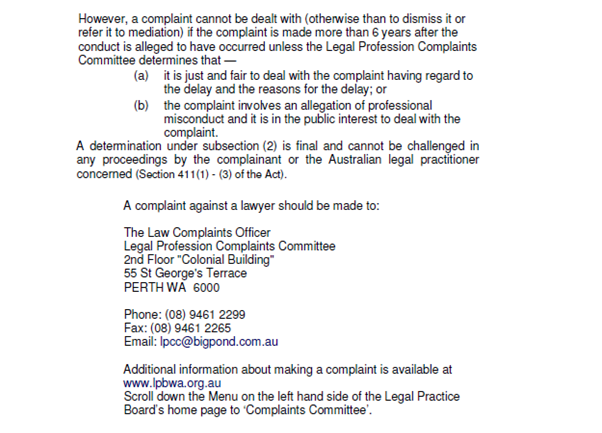 Kyran Borges Nunes is the legal practice director and his charge out rate is $350 per hour (exc GST). We will advise you in writing if another solicitor subsequently takes carriage of your matter. Travelling kilometrage – $0.60 per kilometre. Further, you may incur further disbursements such as court or other filing fees, barrister’s fees and medical and other report fees. The amount of those disbursements will depend upon the amount charged by the relevant third parties. As far as reasonably possible, we will first obtain your consent before incurring unusual expenses on your behalf. You will pay the GST in respect to any goods or services supplied by us to you and supplied to us on your behalf. “GST” has the meaning given in the A New Tax System (Goods and Services Tax) Act 1999 (Cth). 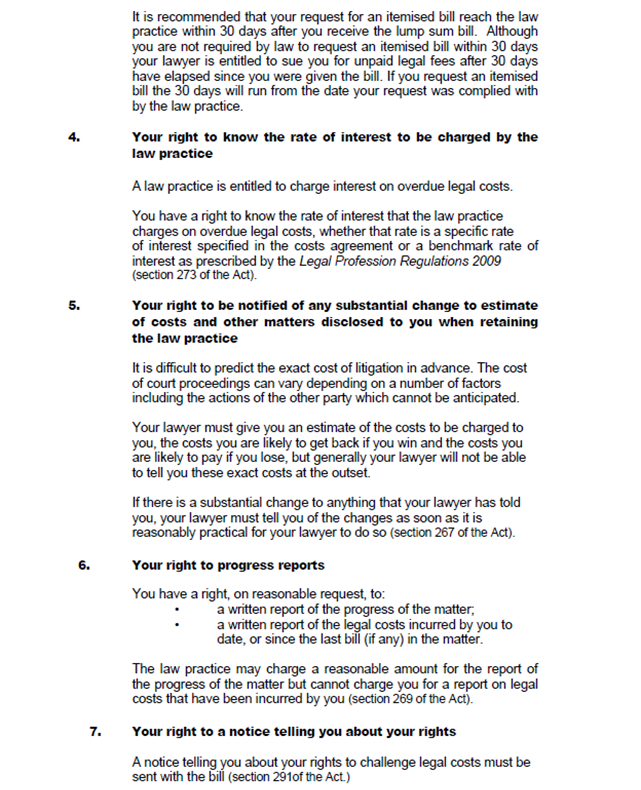 By signing this agreement you will be agreeing to a different basis of charging. The fee scales provide for charges according to different activities and not necessarily dependent on the actual time spent, whereas the basis of charging under this agreement is solely determined by time spent. Certain activities, such as research or internal conferences between legal personnel, may not be included in the applicable fee scales but will nonetheless attract a fee under this agreement. You will ultimately be charged for the work actually done to complete your matter at the hourly rates specified in this document. For example, your lawyers charge out rate is $385 and they will have the primary conduct of your matter as an employee of this firm. We confirm that our estimate (exclusive of disbursements) for representing/assisting you is listed in the Costs Retainer document. For the avoidance of doubt, this is an estimate of our fees only and is NOT a quote. If our fees had to be charged according to the appropriate fee scale, on present information, we would expect to be entitled to charge you approximately three quarters of our fees payable under this agreement. Disbursements would also be limited to the scale, which may be less than the level of our disbursement charges. 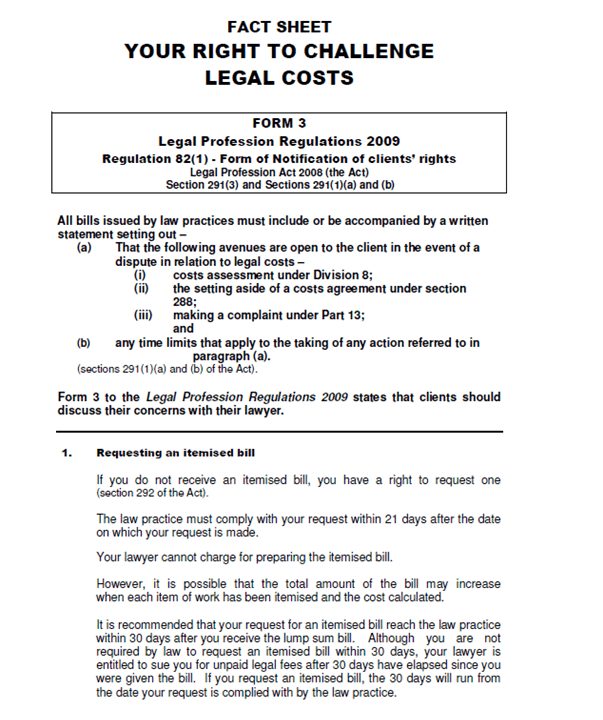 Subject to Clause 21, if you are successful in litigation, you may be entitled to a costs order against other parties. Any costs recovered under such order would be limited to those recoverable under the relevant scale. Again, these would be limited to approximately three quarters of your costs payable under this agreement. Any balance would be non-recoverable. If you are unsuccessful in litigation, you may be required to pay costs to successful party or parties in addition to your costs payable under this agreement. Please note: Our estimate of fees payable under this agreement (if able to be given) is based on the information available to us at the present time, and is not to be taken as a quote. It is often difficult to foresee all the work that may be required to be done, and it may be possible to give revised estimates of costs as the matter progresses. We will provide you with revised estimates of costs upon being requested by you to do so from time to time, which we encourage you to do, and upon our becoming aware of changes in circumstances such as may lead to a revised estimate. We require you to deposit the sum as stated in the Costs Retainer document into our trust account on account of our costs and disbursements. We may also require you to deposit further monies on trust on account of our costs and disbursements from time to time in order to cover our anticipated costs and disbursements. If you fail to provide us with monies on trust within seven (7) days of being requested in accordance with paragraph 23 above, we may terminate our retainer in accordance with paragraph 6(b) of this agreement. All documents prepared by us are protected by copyright and you must not reproduce them without prior written permission. Your file(s) may be destroyed by us upon you giving us written notice and consent to do so, alternatively, we may destroy your file(s) seven (7) years after the completion of your matter. You authorise us to provide personal information obtained from you to other entities to the extent necessary to enable us to provide our legal services to you. Such entities include barristers, other solicitors, auditors, Law Mutual or such other legal insurer, the Legal Practice Board, Courts and Tribunals, Legal Aid WA, and process servers. This costs agreement is effective from the date we first received instructions from you in relation to this matter, and applied to all work already undertaken. 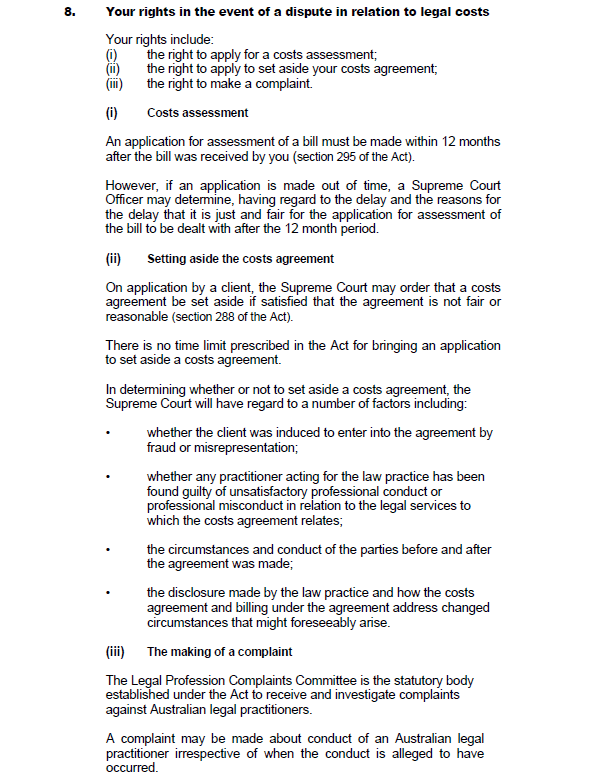 The costs estimate given in this agreement includes any costs already incurred. This document constitutes the sole and entire costs agreement between you and this firm in this matter. To be of legal effect, any variation to the terms of this agreement must be in writing and signed by or on behalf of both you and this firm. You may apply for an order from the Supreme Court that this agreement be set aside. If the Supreme Court is satisfied that this agreement is not fair or reasonable it may grant such order. Paying monies into trust pursuant to this agreement. Failure to accept our offer within fourteen days of dispatch of this document can result in the immediate withdrawal of our offer to act on your behalf. We advise that you may be eligible to apply for legal aid in relation to your matter, but there are no guarantees that you will receive a grant of aid as it is based on the seriousness of the offence, your income and net asset position and your present personal disposition, and having considered that, you have elected to engage us on a private basis and not make an application for legal aid in respect to your matter at this stage. In the event that you have any issues whatsoever with our service or costs then you should contact our Legal Practice Director, Mr Kyran Borges Nunes on 08 6243 7544.